Society for Social Transformation (SST) is an NGO based in the Kurnool district of Andhra Pradesh working in the community development space. The organization promotes social welfare and has strong foothold in its home district as well as in the neighboring districts. SST’s community intervention programmes are largely focused on empowering women and children. Since inception the organization has conducted several awareness campaigns on consumer rights, road safety, environment, climate change and other social issues. Vocational trainings empowering women are also conducted regularly. More than 2,000 people have directly benefited from SST’s campaigns and programmes (Data as on 31st March, 2013). SST is making concentrated efforts to build systems in the organization. To raise donations, the organization has collaborated with seven fund raising organizations. Total Income: During the financial year FY13, SST posted total income of Rs0.9mn. 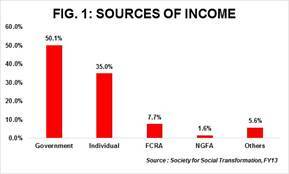 50% of total income in FY13 came from Government sources, 35% from individual donors and the balance 15% was from other sources. 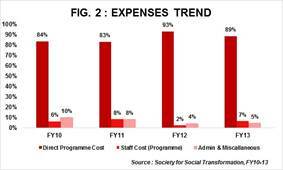 Programme Expenses: 89% of the total expenses was spent towards direct programme expenses in FY13; indicating optimum utilization of funds received. Overhead Expenses: Overhead expenses have declined Y-o-Y and was only 3% of the total expenses in FY13 as against 5% in FY12; thus indicating improving efficiency in managing costs. General Funds: Y-o-Y increase in surplus owing to better management of cash inflow, the organization’s General Funds increased by 30% in FY13. Loan Liabilities: The substantial increase in current liabilities is owing to the loan availed from a Trustee during FY13. This was due to the delay in receipt of donations from a Government body. The loan availed from Trustee will be repaid on receipt of the funds. Income Growth Rate: SST’s total income has grown at a 4-Year CAGR of 15% for the period FY10-FY13. This can be attributed to rising trend in donations received from the government and individual sources. Self-Sufficiency Ratio: Self-sufficiency ratio which measures the ability of an NGO to meet its own expenses by own funds was at 43% in FY13 as against 99% in FY12. The decline is due to the drop in the donations received from individual sources in FY13. Donors: Largest revenue contributor for SST has been grants received from the government sources. There are 5 different Ministries and over 10-12 financial partners supporting SST’s programmes. Participation from donors and continuous support from the government from different states encourages SST to continue serving society. Mr. V. Anjaneyulu, Founder of SST is a qualified social worker and brings with him 18 years of rich experience in the social service space. Prior to starting SST, Mr. Anjaneyulu worked with many voluntary organizations including Confederation of Voluntary Associations (COVA). The Board meets every quarter to discuss the agenda for the next quarter. The organization is accredited by Credibility Alliance.